Many thanks to Alan Dean for the comprehensive explanation of why yesterdays Gull sp was indeed a Lesser black backed Gull. If you had seen the gull in the middle of a roost you wouldn't think twice about calling it a Lesser black backed but a individual gull that you can see every detail of is more likely to get you thinking. It’s a juvenile Lesser Black-back. It still has entirely juvenile feathers – no moult at all yet to first-winter scapulars and mantle, and hence their ‘simple’ pattern. 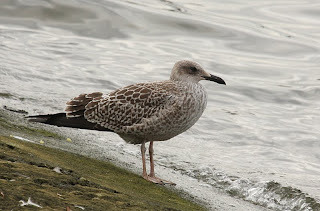 This itself is indicative of LBB in a late October bird (some Herring may not have any 1W feathering by late October but others do, while in rarer species such as YLG and Caspian, being earlier breeders, the young have obvious grey-based 1W feathering to mantle and scapulars by September or even late August). Other LBB characters include the solidly dark tertials with just white fringe terminally, the long wing-projection, and the dusky head. The bill looks quite long but there is individual variation – it’s probably a male.